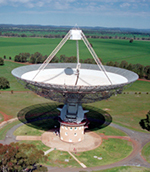 CSIRO’s 64-m Parkes radio telescope. Credit: John Sarkissian, CSIRO. CSIRO’s Parkes radio telescope in eastern Australia has detected mysterious ‘flashes’ of radio energy from the distant Universe that may open up a whole new area of astrophysics. The surprising finding, made by a team of scientists from ten institutions in Australia, the USA, UK, Germany and Italy, is published in today’s issue of the journal Science. “Staggeringly, we estimate there could be one of these flashes going off every ten seconds somewhere in the sky,” said research team member Dr Simon Johnston, Head of Astrophysics at CSIRO Astronomy and Space Science. Four flashes were detected, each from a different direction and each lasting for only a millisecond (a thousandth of a second). The characteristics of the radio signal — how it is ‘smeared out’ in frequency from travelling through space — indicate that the flashes came from up to 11 billion light-years away. A CSIRO radio telescope has detected the raw material for making the first stars in galaxies that formed when the Universe was just three billion years old — less than a quarter of its current age. This opens the way to studying how these early galaxies make their first stars. The telescope is CSIRO’s Australia Telescope Compact Array telescope near Narrabri, NSW. “It one of very few telescopes in the world that can do such difficult work, because it is both extremely sensitive and can receive radio waves of the right wavelengths,” says CSIRO astronomer Professor Ron Ekers. The raw material for making stars is cold molecular hydrogen gas, H2. It can’t be detected directly but its presence is revealed by a ‘tracer’ gas, carbon monoxide (CO), which emits radio waves. In one project, astronomer Dr Bjorn Emonts (CSIRO Astronomy and Space Science) and his colleagues used the Compact Array to study a massive, distant conglomerate of star-forming ‘clumps’ or ‘proto-galaxies’ that are in the process of coming together as a single massive galaxy. This structure, called the Spiderweb, lies more than ten thousand million light-years away [at a redshift of 2.16]. Astronomers using a CSIRO radio telescope have taken the Universe’s temperature, and have found that it has cooled down just the way the Big Bang theory predicts. Using the CSIRO Australia Telescope Compact Array near Narrabri, NSW, an international team from Sweden, France, Germany and Australia has measured how warm the Universe was when it was half its current age. “This is the most precise measurement ever made of how the Universe has cooled down during its 13.77 billion year history,” said Dr Robert Braun, Chief Scientist at CSIRO Astronomy and Space Science. According to the Big Bang theory, the temperature of the cosmic background radiation drops smoothly as the Universe expands. “That’s just what we see in our measurements. The Universe of a few billion years ago was a few degrees warmer than it is now, exactly as the Big Bang Theory predicts,” said research team leader Dr Sebastien Muller of Onsala Space Observatory at Chalmers University of Technology in Sweden. Outbursts of super-hot gas observed with a CSIRO radio telescope have clinched the identity of the first known “middleweight” black hole, Science Express reports online today. More atomic hydrogen gas — the ultimate fuel for stars — is lurking in today’s Universe than we thought, CSIRO astronomer Dr Robert Braun has found. This is the first accurate measurement of this gas in galaxies close to our own. By taking a new look at some archival data, Dr Braun, Chief Scientist at CSIRO Astronomy and Space Science in Sydney, Australia, has discovered that galaxies around us are hiding about a third more atomic hydrogen gas than previously calculated.